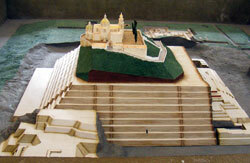 What if the Aztecs had defeated the Spanish? Did pre-Columbian dances survive the Conquest? Just how DID the Aztecs see the Conquistadors? Before the Spanish came, just about EVERYTHING the Aztecs did was watched over by a god or goddess, from lighting a fire at home in the morning to going to work - or to war. The Spanish thought Aztec religion was just mumbo-jumbo, so they got physical - burning old books and building churches on top of old temples. 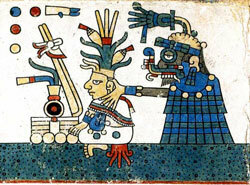 Can you see Tlaloc among the gods being torched? Q. Of the hundreds and hundreds of books the Mexica had, guess how many are still around today? A. Less than 20. This is NO joke! This is one of two superb answers we have received from experts to this question, raised by a school during a Mexicolore team workshop on the Aztecs. We are delighted that Dr. Eleanor Wake and Professor Alan Sandstrom have both generously prepared articles in response. Dr. Wake’s is here, Professor Sandstrom’s is in our Aztec Gods section. 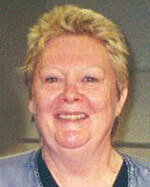 Dr. Wake is Lecturer in Latin American Cultural Studies, Department of Spanish, Birkbeck College, University of London. This is a challenging question, especially as it assumes that the gods survived the conquest. Many of them did, but in different ways, some of which are also very difficult to define. There is, therefore, no straightforward answer but you might like to think about the ideas included in the response. At the time of the Spanish arrival, religion and the gods dominated every aspect of native life, in urban and rural areas alike. Despite their political, economic, and religious power, the Aztecs (or the Mexica, as they called themselves) were no different and understood that they had to worship the gods with the same fervour as everybody else. 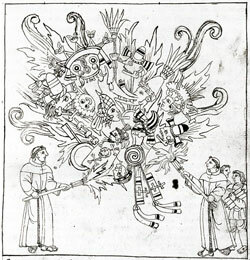 Apart from recognising the role of the gods in the creation of the Fifth Sun, or the world age in which the Mexica and their contemporaries lived, all knowledge and cultural advancements, such as astronomy and the workings of the calendar, the cultivation of food crops (especially maize), literature, music, the crafts, medicinal cures, etc., were also believed to be gifts from the gods to humans. In addition to the great religious festivals in honour of the gods to thank them for their gifts and to ask for continuing favours, everything people did, from lighting the fire in the morning, working in the fields, going to war, or even writing books, was therefore also understood to have been made possible and still watched over by one or more of the gods. As a result, the pantheon of the gods was large and very complex. The Christian evangelisers [missionaries] believed the native religion to be nothing but superstitious mumbo-jumbo, focused mainly on hideous and bloodthirsty images, or idols, in stone or other materials, which the natives worshipped as gods (Pic 1). The missionaries therefore thought the religion could be eradicated very easily by destroying the gods and everything that appeared to be related to them. They smashed the idols, demolished the temples, burnt the sacred books (in fact, because they couldn’t read them they burnt all the books), and killed off or banished the old priests (Pic 2). These they replaced with Christian equivalents: statues and images of the Holy Family and the saints, bibles and prayer books, and their own clergy. They also ordered crosses and/or churches to be erected on the sites of the demolished temples, on the tops of pyramid platforms that proved too difficult to pull down, or over other sacred spots on the landscape where they knew the gods had been worshipped (Pic 3). The broken idols were often used as rubble to lay foundations or build walls (Pic 4). This was done so that the Indians could see how their false gods were now obliged to physically support the true Christian god. Whether the Indians understood this type of symbolism is open to question, for it depends on how they perceived the carved and painted gods in the first place. It soon became clear to the missionaries that the images of the gods were only representations. The real gods were elsewhere and the native peoples were still worshipping them in secret. This usually involved carrying out rituals on mountain tops and in caves, in the fields where they cultivated their crops, or in private houses. In these places, often very large groups of “idolaters”, as the missionaries called them, would eat and drink, sing and dance, sacrifice chickens, and draw their own blood, invoking the gods by name and honouring them just as they had done in the pre-Christian era. While human sacrifice disappeared almost completely, occasionally statues of the gods that had escaped the destruction were brought along to the gatherings, or surviving ritual books consulted. But even the discovery and subsequent destruction of these items did not deter the Indians. They continued to worship their gods without them. The evangelisers were baffled. The gods were obviously still very much alive, but the means of identifying them was a mystery. They also realised that the native religion was rather more complex than they had originally thought. 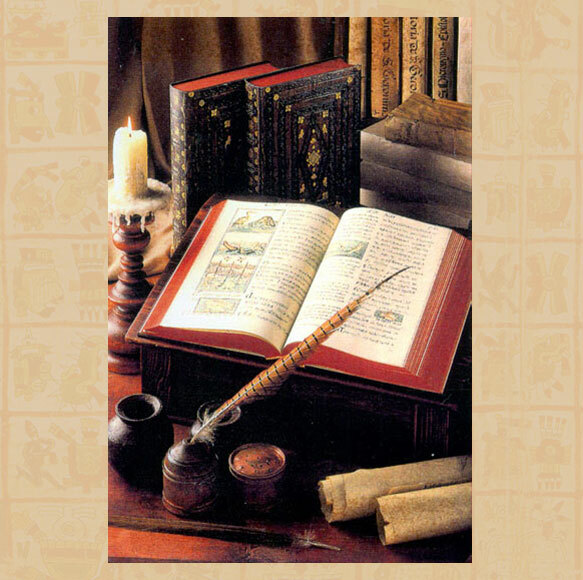 Writing in the middle of the sixteenth century, Fray Bartolomé de Las Casas summed up the situation as follows: “concerning the native peoples’ religion and its characteristics we [the evangelisers] have not understood even one of its thousand or ten thousand parts.” As a result, some amongst them, such as Fray Bernardino de Sahagún, the compiler of the Florentine Codex, initiated a series of investigations into the prehispanic world in order to properly understand the old religion and the gods and get rid of them once and for all. These produced some early results, principally the connections they were able to make between the native calendar and the gods, who not only presided over its divisions, but also the timing of the rituals. So they prohibited the use of the tonalpohualli, or 260-day ritual count, and insisted that the 365-day year count (xiuhpohualli) should follow the European system. Broken down into 18 “months” of 20 days, it was also a cue for the celebration of the old religious festivals that followed the solar year. But the rituals did not cease for the Indians found other ways to maintain the counts of the days. As scholars are now beginning to confirm, one of these was to correlate them with the Catholic calendar of saints’ days. This system is still used today in some places. By the end of the century further progress had been made but it was still not enough to rectify the problem. As another religious chronicler wrote in 1629, according to the Indians the gods lived in all parts of the land, on mountains, in valleys, ravines, lakes and springs. However, the task of finding them or understanding why they were still being worshipped was “like trying to catch smoke or wind in one’s fist”. Even worse, by this time the idolaters were also penetrating Christian space with their rituals. 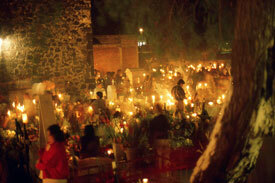 Sometimes (usually at night) they used the churchyard or the inside of the church itself. This did not mean that they rejected Christianity, however, for they would offer half of the ritual foodstuffs, feathers, flowers and other paraphernalia to Christian images. The other half, it was noted, was given to the old gods – wherever they were. Many of the gods did therefore immediately survive the conquest, and the seventeenth-century chronicler’s observations might give us a clue as to what the Indians believed them to be. To understand this and why they were still being worshipped we should first take a brief look at what the native religion system was all about. 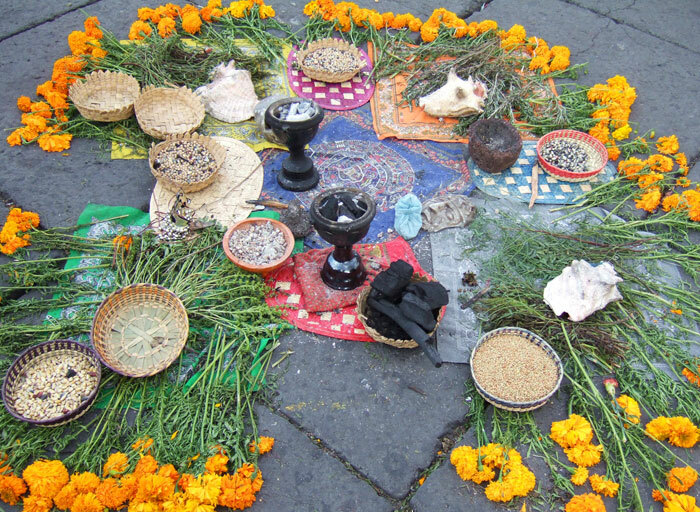 We refer to the religion that the native peoples of Mexico followed as a “system” because it was made up of many differing and changing beliefs and forms of worship which all settled peoples nevertheless practiced collectively. Creations myths were not all the same, for example, or the levels of importance of individual gods. Ritual activities and artefacts also varied considerably. For everybody however, the main purpose behind the system was to ensure the perpetuity of the world that human beings lived in (a gift from the gods that could be taken away at any time), and the survival of humankind itself across generations. For this reason, the production of food as the most basic element needed for survival became one of the most important focus points of religious thought and activities. The Mexica and their contemporaries worshipped what we might call “types” of gods although it is never possible to categorise these in a clear-cut way. Because the gods did “possess all things” and were “the lords of all”, they interacted together across native society. As a result, some overlap, with each other but also as different manifestations of themselves within another role type. 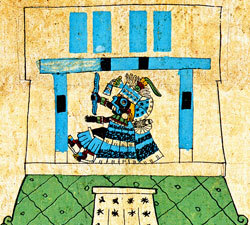 There were, for example, certain gods who were recognised as creators, such as Ometeotl (“Two-god”) who lived in the highest level of the sky. As the name suggests, he/she was a double god who represented the male and female aspects of the world. Quetzalcoatl (“Feathered Serpent”) was also a creator god and especially venerated as a giver of knowledge and a great “civiliser” in the sense that he had taught humans how to live in an organised way within their new agricultural communities (Pic 9). 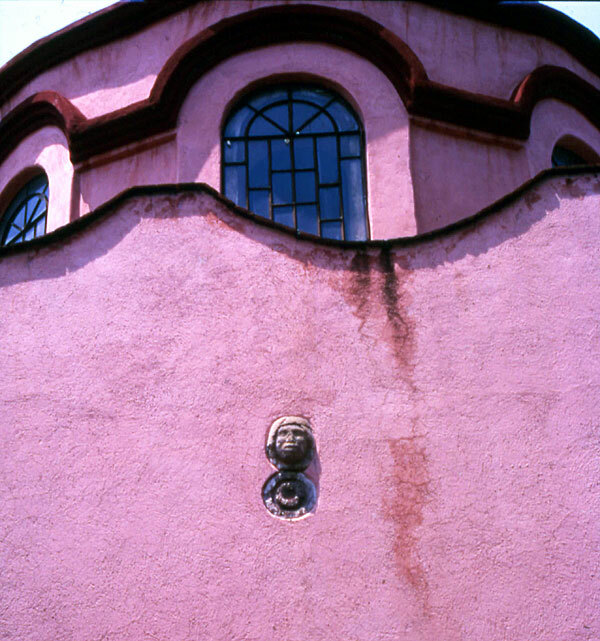 His main shrine was at Cholula where he was also recognised locally as the patron of merchants, but nationally as the god who endorsed the legitimacy of rulership. 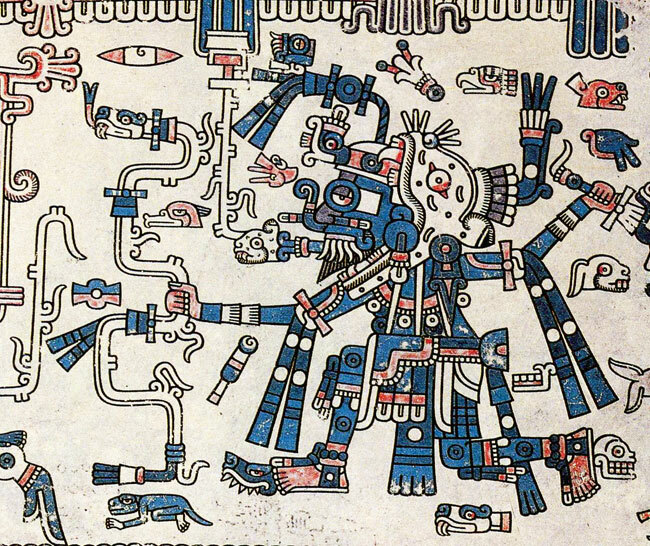 Another important creator god was Tezcatlipoca (“Smoking Mirror”) who, depending on his mood, was an adversary or collaborator of Quetzalcoatl (Pic 10). 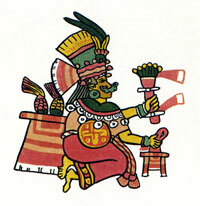 Tezacatlipoca probably had more avatars, or manifestations, than any other god. As Ipalnemoani (“Life-giver”), Tloque nahuaque (“He who is near to things/is everywhere”), or Titlacahua (“We are his servants”) he was an all-powerful entity, described as “invisible and untouchable like the night and the wind”. Nevertheless, he could see everything and everybody through his special mirror and thus control the world. The Mexica believed that he was the god who chose their kings among those eligible to rule. Probably one of the largest and most important groups of gods, however, represented the forces of nature or especially sacred features of the natural world. Therefore they certainly did live in, or were the mountains and valleys, lakes and springs. In fact, together they made up the cosmos, and the landscape of the terrestrial plain. All nevertheless interacted with one another in order to keep the cycles of time, and of life and death, in constant motion. Because of their direct associations with water, earth, and sun, this group of gods were of primary importance in the cultivation of maize. As a result, they were the gods who were most worshipped in secret after the conquest. Although the Spaniards introduced wheat and other European foodstuffs into the colony, these served principally to satisfy their own alimentary preferences. For the greater part of the native population maize remained the staple and because it was unknown in Europe its mode of cultivation did not change. Neither, of course, did the climate and the type of terrain needed to cultivate it. The species of maize traditionally grown in Mexico is dependent on a series of important stages of cultivation that have to be timed perfectly in order to take advantage of Mexico’s usually predictable climate of dry and rainy seasons. An ideal cycle would see the seeds sown at the end of the dry season when the early, light rains offer enough moisture to germinate them without the soil becoming waterlogged. Once the young plants are established, the rainy season proper provides them with enough daily water and periods of sunshine in between to grow into mature plants, at which point the young maize cobs are born and begin to swell (Pic 11). As the rainy season starts to draw to a close, the fully grown cobs are able to ripen in the considerably warmer sunshine of the incoming dry season, until they are ready to be harvested. Although other considerations are made to protect the maize fields (from rodents and birds, for example), a successful harvest depends mainly on the regularity of weather conditions, from the beginning of the cycle to its end. If the rainy season is late, the young plants might dry up and die. If the rainy season continues into the period of ripening, the cobs will rot. Sudden frosts are another constant hazard. Translated into the religious belief system of Mexico’s traditional communities at the time of the conquest and after, this means that a successful harvest depended on the benevolence of the gods. Together they were the earth, the rain, and the sunshine. A successful crop also depended on the calendar (another gift of the gods) so that each stage of the cycle could be coordinated properly, in terms of work in the fields and rituals to the gods to ask and thank them for favourable outcomes. 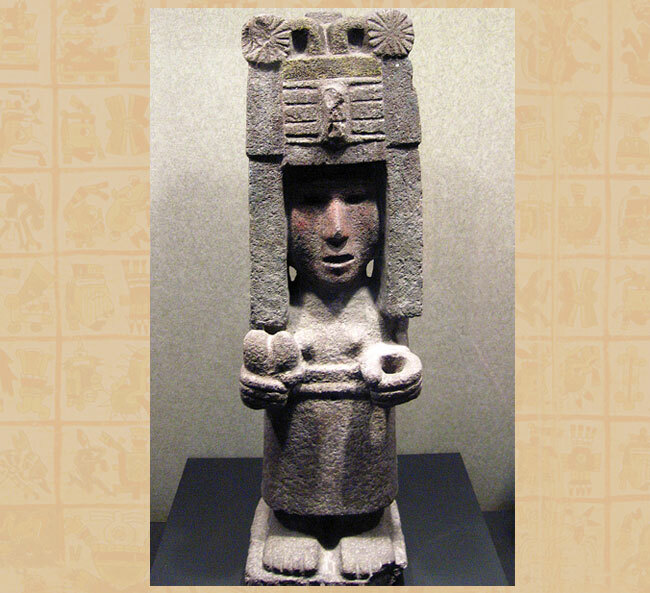 Among the many gods directly concerned with the maize cycle, we find, for example, Cihuacoatl (“woman-serpent”), an earth goddess who, among other things, presided over the dry, barren months before the rainy season opened (Pic 12). She was an old goddess, with a skull-like face that symbolised death in the sense that her body could no longer give birth to new life in the form of food. However, with the coming of the spring rains she was replaced by a younger earth goddess who would oversee the renewed fertility of the earth so that the young maize seeds could start to grow. Tlaloc, the supreme rain deity, was especially venerated because nothing can live or grow without water. In addition to his strange face, he was usually depicted in the codices carrying a staff in the form of a winding serpent (see Pic 1). 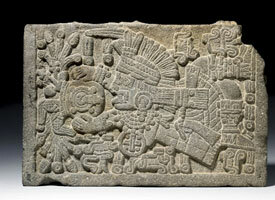 This represented lightning, a natural element closely associated with rain and which Tlaloc also took command of. 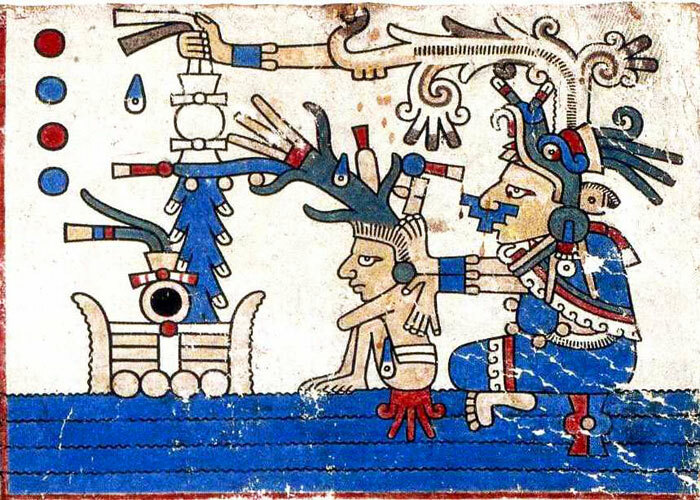 The god employed a large group of messengers, called tlaloque (“tlalocs”) who guarded the rainwater as it soaked into the mountains, releasing it into rivers, pools, or springs when it was requested, for domestic or irrigation purposes. But the tlaloque also flew over the fields watering the plants at the right stages of growth, with rain of the right type and in the right quantities (Pic 13). 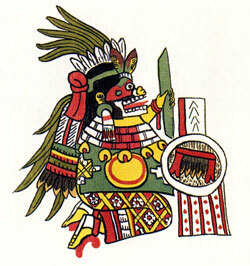 Tlaloc’s consort [wife] was Chalchiuhtlicue (“Jade Skirts”), the goddess of terrestrial waters such as rivers, pools and lakes. It was she who “gave birth” to the water accumulated inside mountains and was therefore also a mountain. However, if the rain and water deities were not prayed to properly — or not prayed to at all — by their human subjects, they could become angry and call out the destructive forces of rain: a violent storm, for example, or no rain at all. 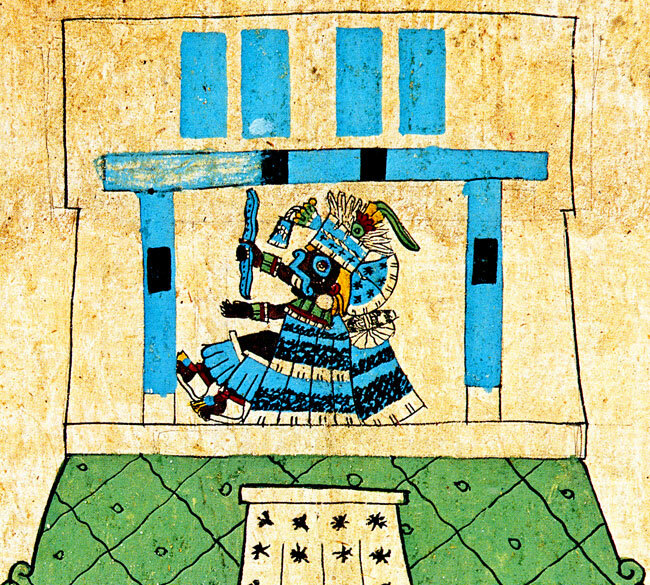 In the Fejérváry screenfold (one of the very few “ritual manuals” to have survived the conquest) we see Tlaloc gently supporting a humanised maize plant growing from a turquoise soil with black grains (Pic 14). This means that the earth is moist but firm and the maize plant will prosper. In front of both figures is a recipient containing burning incense. Tlaloc is obviously pleased with the offering. 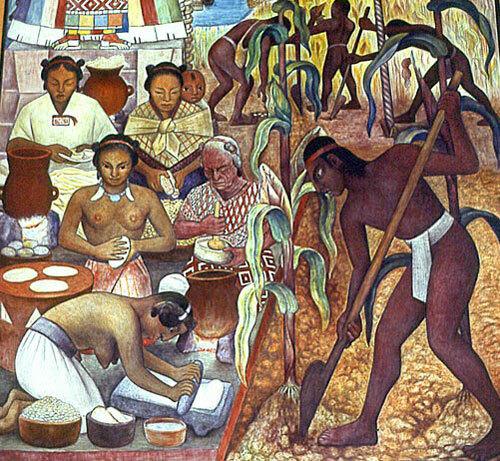 However, in another panel from the same codex we see Chalchiuhtlicue roughly pushing over another humanised maize plant in a field that she has flooded (Pic 15). From the goddess’s head extends a third hand which she uses to extinguish the incense offering! The reason there were so many rain gods is because each of them represented a different type of watery precipitation or watery deposit. The same is true of the earth and sun gods. How many kinds of rain, water deposits, soil types, and sunshine can you think of, and if you were a maize farmer which of them would you prefer to visit your fields? 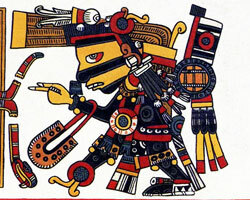 Tlaloc’s name, which roughly translates as “extended over earth”, indicates that he was also associated with the earth deities. Descriptions of the representation of Tlaloc at Tenochtitlan state that it was filled with all the seeds of the land because he was the god of the sown fields. This reminds us of the mythical mountain of sustenance that was broken open by the gods after the creation, which also contained all the seeds of all the foods humans needed to survive. It was subsequently guarded by the tlaloque who distributed them as and when needed. In fact, from a description of a special shrine to Tlaloc located on top of a mountain named after him, we understand that he and his messengers were also understood to be mountains. 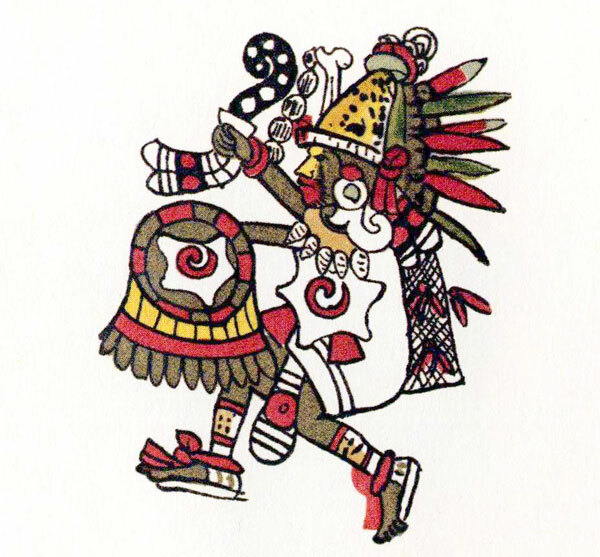 In short, all the tlalocs together were rain gods and agrarian gods, possibly the general overseers of the cultivation process from germination of the seeds to harvest. They were also a part of an unchanging landscape, taking the form of sacred mountains that are still worshipped today and specially thanked at harvest time. 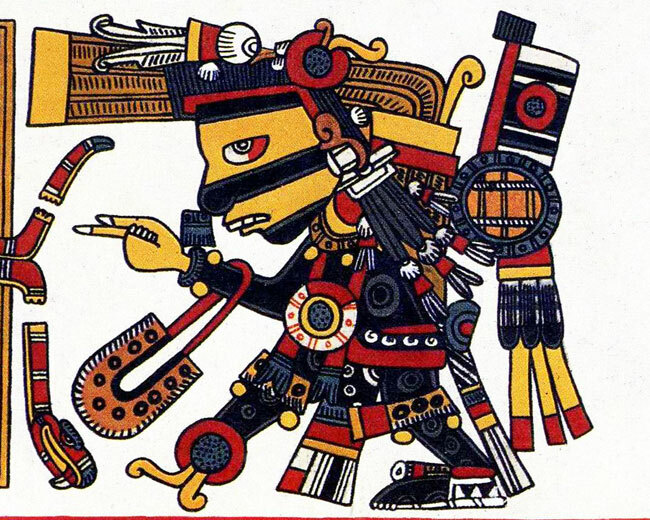 The creator gods Quetzalcoatl and Tezcatlipoca also intervened in the cultivation of crops and in the examples that follow we can see how they were understood to interact with the other gods. 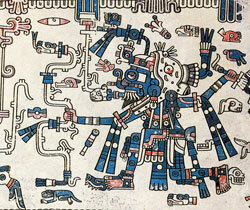 One of Quetzalcoatl’s very important manifestations [roles] was as Ehecatl, god of the Wind (Pic 17). He is always recognisable in this role for he wears a, usually red, elongated mask rather like a beak over his mouth and nose. Sometimes a small curved fang appears at the corner of the mouth; in other depictions, the “beak” is seen to be full of sharp teeth. We are not sure what the mask represents but it is Ehecatl’s personal trademark. 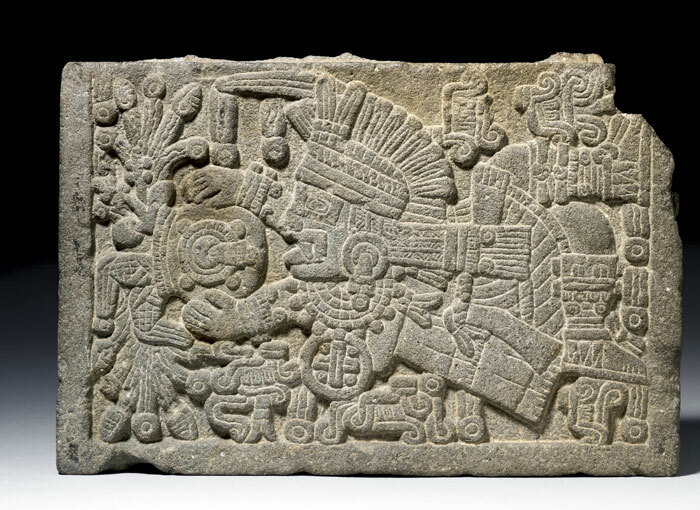 Can you spot Quetzalcoatl-Ehecatl among the burning gods in Pic 2? Another of his characteristics, which he shares with Quetzalcoatl the civiliser, is a conical hat made of jaguar skin (See Pic 9). 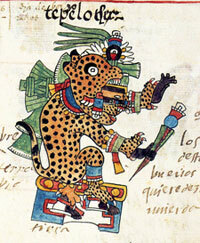 Ehecatl represented the wind that precedes the rain, and therefore worked with Tlaloc. In another of his many manifestations, Tezcatlipoca took the form of a mountain god by name of Tepeyollotl (“Mountain Heart”) (Pic 18). He was likened to the jaguar, a creature of the dark (like the inside of mountains) whose roar was the thunder as it echoed around the mountains and valleys. 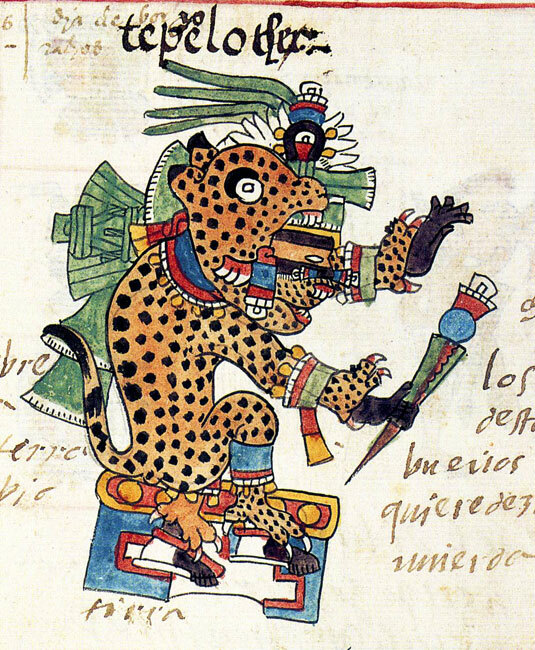 As such, he was also related to Tlaloc who, in addition to his serpent lightning staff, also often wears a jaguar-head helmet (see Pic 1). As a herald of the rain, most specifically a thunderstorm, Tepeyollotl was also related to Quetzalcoatl-Ehecatl, as reflected in the Wind deity’s jaguar skin hat. Due to its importance as the basic foodstuff of the native peoples, the maize plant was a god in its own right, but was divided up into a series of different deities that embodied the main parts of the plant and its stages of growth. Important examples might be Xilonen, the young maize goddess who was present in the plant as the tiny cobs (in Nahuatl, xilotl) started to sprout (Pic 19). 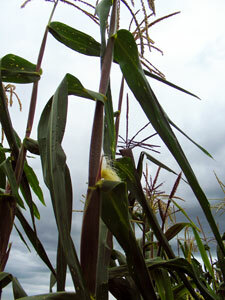 As the cobs swelled and started to ripen, the older maize goddess Chicomecoatl (“Seven Serpent”) took over (Pic 20). Her name echoes the positive and negative sides of her nature. A maize plant carrying seven cobs was considered to be the sign of an abundant harvest. However, she could also allow the ripened cobs to be “bitten” by her serpents, that is, attacked by frost. In some images of goddess she is seen holding a pointed object with jagged sides that may well represent frost. 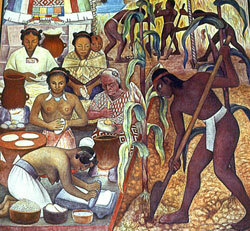 Finally, when harvest time arrived, Cinteotl (“Maize Cob God”) would appear. As his name indicates he was the maize cob itself, the source of human survival. When in Mexico, years ago, I bought a statue of the Corn God -- do you know where I can by that now? 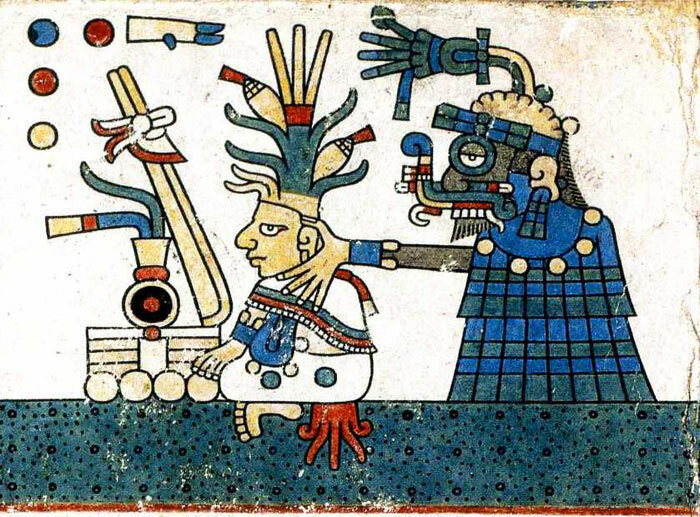 Pic 1: you depict above of Tlaloc, the supreme rain deity, holding a twisted serpent staff, and depicting jaguar fangs, and goggle eyes, is from the Late Postclassic Codex Laud, page 2. I wanted to just point out what I have demonstrated in my study of the iconography is the Old World fleur-de-lis emblem located just above Tlaloc’s head. Mexicolore replies: Intriguing, Carl, thanks for this. There’s a similarity, sure, but there are distinct differences too. The coincidence must stem (sorry!) from the basic floral form (lilly) used in both. Great article. This should’ve been part one to this series. Other than the misconception that Europe was the one that invented the 365 day calendar, the way it is written makes it sound like the xiuhpohualli, the 365 day calendar, was invented after the conquest and not before. 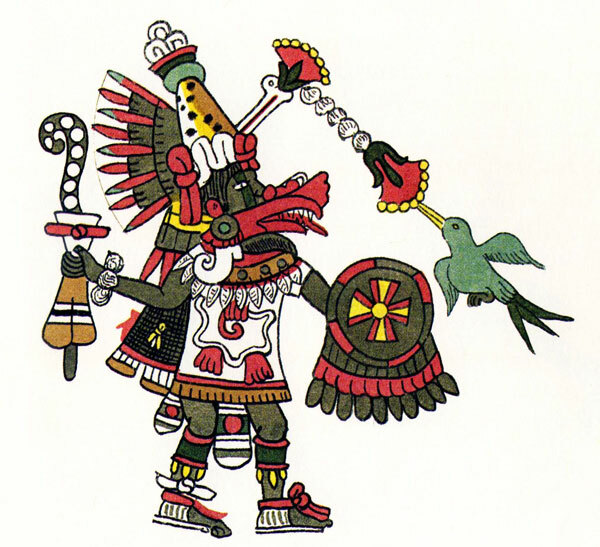 I always thought Quetzalcoatl’s manifestation as Ehecatl having the beak was to express the same thing as birds since birds know how to fly including flying through the wind.